A revolutionary way to buff and polish all metal and painted surfaces. 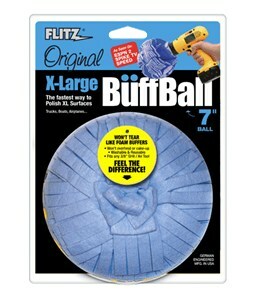 The Flitz X-Large Premium Buff Ball can be machine washed and reused up to 10 times. The Buff Ball fits on a standard 3/8" drill (not included) for unsurpassed ease of use and speed in achieving a mirror-like finish. Power-rated for speeds up to 2500 rpm, the felt Buffer Balls polish in record time and won't scorch or burn. This premium buff ball won't tear like foam buffers when hitting sharp edges. No exposed ball hardware to scratch surfaces. Made of soft Italian viscose fiber. Will not shed lint. The 7" Flitz Buff Ball is perfect for large flat or textured surfaces like large trucks, boats, semis and airplanes. Works well on elevator doors and railings. Quickly and easily buffs out brake dust, scuff marks, light scratches, oxidation, chalking, tarnish, pitting and corrosion. For best results use with Flitz Polish-Paste or Flitz Polish-Liquid.